When a fluorescent tube is ignited, light is given off evenly in every direction, much of which is directed upwards into the lid of the aquarium. If a reflector is mounted behind the tube, this stray light is not wasted, but redirected back to where it is required, so that the efficiency of the tube is maximised. By using a reflector you are able to focus the total light output, including the UV component, and generating a much more effective basking zone. The use of the right reflector with the right lamp can actually triple the amount of UV available to the animal. One high output T5 lamp will do the job of four separate Arcadia T8 lamps on its own. Reflectors certainly play their part in helping to achieve this huge improvement in efficiency. A D3 or 6% high output T5 lamp with a reflector will provide a massive 150+mws at 38cm (15in),compared with around 45mws from the T8 equivalent! 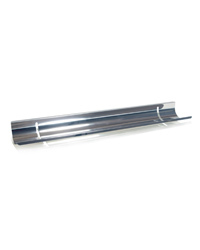 Great easy to fit into vivarium reflects all uv ray's into the vivarium and can be angled to suit the direction you wish the rays to be reflected into different areas. This reflector is certainly good at producing more light but I found it hard to fit in place.